As Dante hit the road for a handful of Scottish shows to warm up before heading across the pond for their first foray into performing stateside, I caught up with singer, guitarist and songwriter Sean McLaughlin before their set at Edinburgh’s Electric Circus for a blether about the tour, heading to the states and gearing up for the release of their second album. So far the tour is going well for Dante; bar one cancelled show each performance has gone down a treat, McLaughlin saying it’s good to get away from the central belt and main cities to beat the track slightly less trodden. McLaughlin hails from Shetland originally himself, so he must be relishing the opportunity to play some more stripped back material in similar locales to where he grew as a musician and as a person; though towns like Perth and Inverness are hardly as rural as Shetland, in comparison to Glasgow or Edinburgh it’s decidedly more modest. Support tonight came from acoustic two-some Alan Carberry & Sian as well as solo multi-instrumentalist A.H. Doune. I can’t say much on these guys as I was upstairs chatting with Sean during their sets, but the brief couple of minutes I overheard of each set were pretty good – Alan Carberry & Sian performed the most delicate acoustic set, just their fragile vocals and guitar to accompany; and A.H. Doune gave us a set of trippy, bluesy loops and massively reverberated vocals as a one-man band of electric guitar and a desk rammed with a laptop and countless gizmos. As for Dante’s set, I probably wouldn’t have known it was an acoustic gig if I hadn’t been told – they sounded as confident and full-bodied as any ‘plugged in’ act, the acoustic guitars and mandolin offering an alternative sound to Dante’s music rather than a more minimal one. The financial viability of perfoming in the US has previously been an issue for Dante, citing now to be the time to head over in the run up to their second-album release and now having the far cheaper option of lugging only a handful of guitars across the Atlantic rather than a full band rig, though they should be safe in the knowledge that this decision has in no way sacrificed the quality of their live performance. They play a few existing songs to start proceedings, like ‘Ghost’ and ‘Know Where You Are’ … “A poet’s muse, every line is a bruise, it’s a full time job to pretend you’re abused” It’s a shame their professional sound and stunningly mature lyrics are falling on the ears of a sparse crowd, but it’s their loss! “Okay, this is the point in the set where it all goes very well, or very badly… Very well, definitely!” McLaughlin is obviously confident in his songwriting ability but that quintessentially Scottish sense of self-doubt can’t help but peek through, more humbling than debilitating and only feeding the emotional strength of the songs their self. 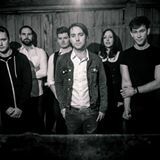 His influences range from the obscurest local folk singers of his hometown through to popular modern acts like Frightened Rabbit, Gaslight Anthem and Idlewild – McLaughlin also plays as part of The Birthday Suit, a side project of Idlewild guitarist Rod Jones and he expresses his satisfaction from playing with a musician he looked up to for many years. Mercury prize winning fellow Leithers Young Fathers even cropped up in conversation and shows his taste in music is not just based on folk or indie but anything soulful that comes from the heart and manifests in a primal, unpretentious way. I asked Sean how the new material would differ from that of the first album (produced again by Andy Monaghan of Frightened Rabbit) and he cites the biggest influence on his songwriting now is parenthood – every singer says the same, that bringing a child into the world shifts your outlook drastically and it undoubtedly spills over into your work. His perspective has changed but his head (or heart, rather) is always cast back homeward as Sean admits that his lyrics are sometimes autobiographical but always set in Shetland; “I’m 30 now, with 2 kid, so I can no longer pretend to be a young guy from Shetland, singing about teenage problems of ‘Ooh, my girlfriend doesn’t like me, I haven’t got any money! '” McLaughlin has changed but Shetland has not, still offering the same emotional pull and warm imagery that defines the lyrical style of Dante. Though one of the songs performed tonight came from such a period (having been written when Sean was only 17) the massive age gap in the songs is unnoticable, the established and the unreleased offering real continuity in the setlist. My personal favourite of the new bunch was ‘Rose’, a quick paced song both fast and mellow with the mandolin constantly picking away a pedal over the top. The whole band provide backing vox to stunning effect, giving off that gather-round-the-hearth country pub singalong feel and it warms the soul. Of his next album, McLaughlin reckons it’s not as outright ‘folky’ as the first as family life in the capital has obviously distanced him from the comforts of home, though he has no qualms about being regarded as primarily a folk musician. Reductive media tags aside, if tonight’s perfomance is anything to go by they will go down a storm in both Philadelphia and the Big Apple; the market for folk in Scotland is saturated to say the least and will be a welcome, niche change of pace in the land of freedom. Best of luck guys, though I doubt you need it! 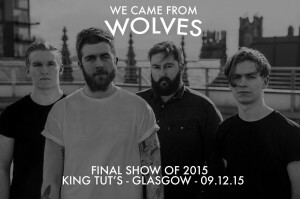 It’s been a busy year for We Came From Wolves who finish of the year with their final show at King Tuts in Glasgow in just over two weeks time (December 9th). Given they’re one of our faves @ FEAST we thought we’d post a video they did in our studios for the #SAMAFEASTSESSIONS – a little taster of the delights in store for you. We Came From Wolves final show of 2015 is just over two weeks away and tickets are selling FAST. Grab your’s and join the party on Dec 9th!